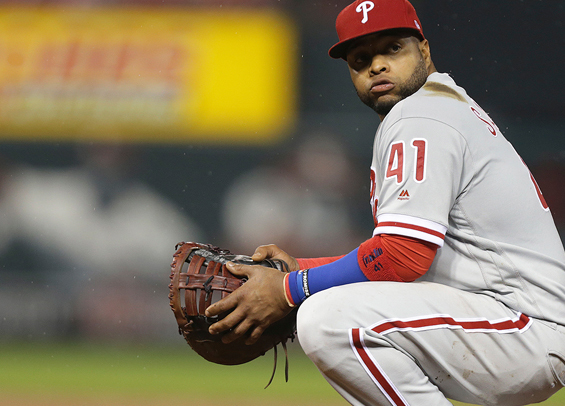 Could Carlos Santana be on his way out of Philadelphia? The Phillies may be shopping veteran Carlos Santana around in an effort to more easily accommodate Rhys Hoskins and his move back to first base, this according to Ken Rosenthal of The Athletic. Rosenthal reported this morning that one rival executive said the Phillies are "selling the hell" out of Santana in an effort to move the 32-year-old. Santana inked a three-year, $60-million contract with Philadelphia last winter. He hit a career-low .229 in 2018, though he also finished with 24 homers and 86 RBIs to go with a 105 OPS+. The Phillies find themselves in a bind because Hoskins has been a disaster defensively in left field and he's asked to move back to his natural position at first base. This would displace Santana, though he potentially could slide to third base and leave Maikel Franco as the odd man out. If the Phillies do move Santana, it's likely the club would have to eat a sizable chunk of the $40-plus-million he's owed over the next two years.